The 1986 Goldwater-Nichols Department of Defense Reorganization Act was the most significant legislation for the U.S. Armed Forces since the National Security Act of 1947. The increased unification the Goldwater-Nichols Act was intended to bring to the Department of Defense was considered too extreme by some, but insufficient by others. Professor Douglas Lovelace assesses many of the act's major provisions. He describes the congressional motivation for passing the act, assesses the extent to which the act has been implemented, discusses its impact on the Department of Defense, and offers recommendations for furthering the purposes underlying the act. The author's critical analysis leads him to conclude that the Department of Defense and the nation have benefited from the substantial implementation of the Goldwater-Nichols Act. 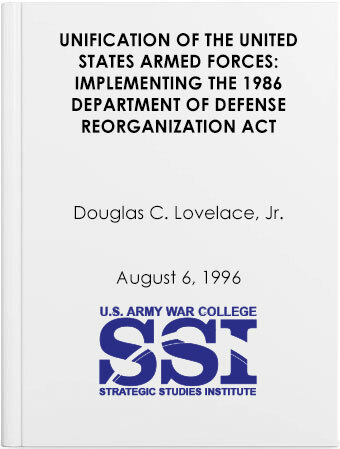 As we approach its 10-year anniversary, however, Professor Lovelace finds significant room both for the Department of Defense to complete implementation and for the Congress to enact modifications to more coherently focus the act on its central purposes. His thought-provoking analyses, conclusions, and recommendations should fuel discussions of the extent to which the act has, or can, achieve its intended results.